Sorority recruitment is one of the most exciting times of the year. After all, your chapter is finding new sisters and creating meaningful connections that will last long after you graduate. Recruitment can also become stressful, but it doesn’t have to! Sorority recruitment software helps you gather and organize information on potential new members (PNMs) and share it with the other members of your chapter for an easy and efficient voting process. Using sorority recruitment software, you’ll be able to identify PNMs who will be great members now as well as long-term supporters of your sorority. A central component of sorority and fraternity management software systems, recruitment software allows your chapter to store, share, search, and organize important data on PNMs throughout the recruitment process. Choose sorority recruitment software that generates useful reports. Use your recruitment software to segment PNMs for a more effective voting process. Initiate connections between current members and PNMs with your sorority recruitment software. 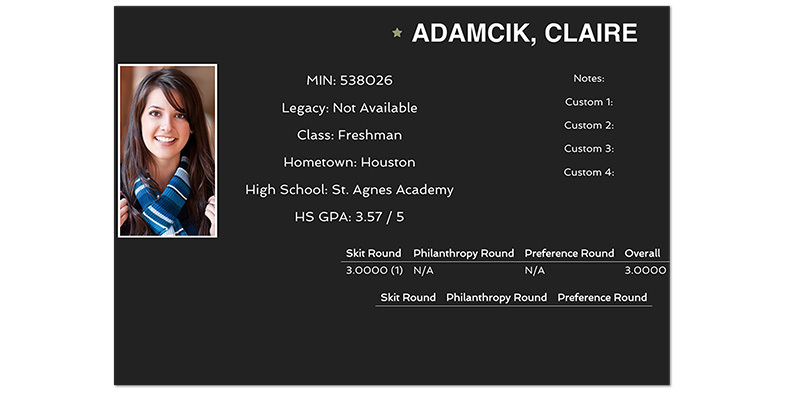 Share key information with voting members using your recruitment software’s slideshow feature. Use your sorority voting app to stay up-to-date throughout the recruitment and voting processes. Because recruitment is a process that involves many members of your chapter, you’ll want to use recruitment software that makes relevant data on PNMs easy to share and clear to understand. We’ll begin by taking a look at two central and related features of recruitment software: data management and reporting. 1. 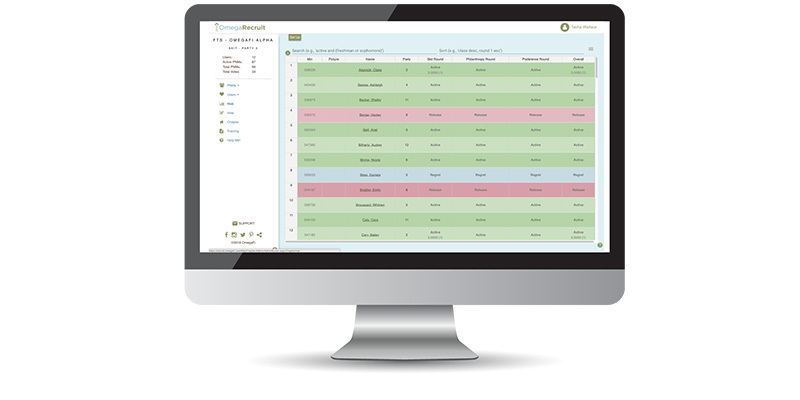 Choose sorority recruitment software that generates useful reports. Selecting new members for your sorority is an important responsibility shared by all of the voting members of your chapter, so it is essential that everyone has access to relevant information on PNMs and can add data as they obtain it. When selecting sorority recruitment software, ensure that your choice makes it easy to store, access, and evaluate PNM data. Can I access all of my data from one central location? Because you are likely to obtain new information on PNMs throughout the recruitment process, you’ll want to choose software that makes it easy to find the information you need even as you input additional data. Can I create visual representations of selected data to share with other voting members? Graphs that display selected data relating to PNMs, voting members of your chapter, and votes make it easy to understand key information, observe trends, and share data with fellow voting members. Whether you’re looking at statistics before voting or a breakdown of the results after the votes are in, visual representations are helpful throughout the recruitment process. Can I observe patterns in my data through statistical analyses? Software that provides statistical analyses of your data, including averages and standard deviations can illustrate important trends in your voting and recruitment data. 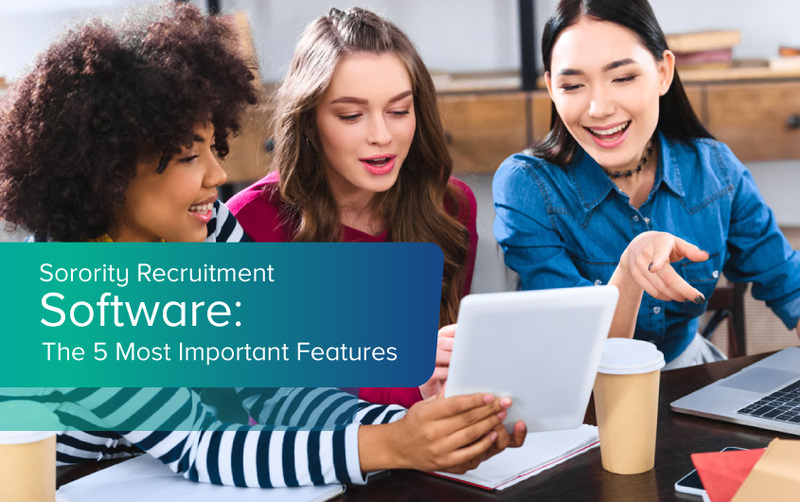 If your sorority is already using a software system or app to organize your activities, consider recruitment software that integrates with your existing system. Visit OmegaFi to learn more about sorority management systems and recruitment software designed for use with these popular platforms. Managing large amounts of incoming information during recruitment becomes much simpler when your chapter finds the right sorority recruitment software for your organization’s needs. Look for software that not only stores and organizes your data, but also displays it in ways that facilitate understanding and use. PNM Reports containing relevant data on potential new members, which help inform your voting members’ decisions and ensure that you select the best new members for your organization. 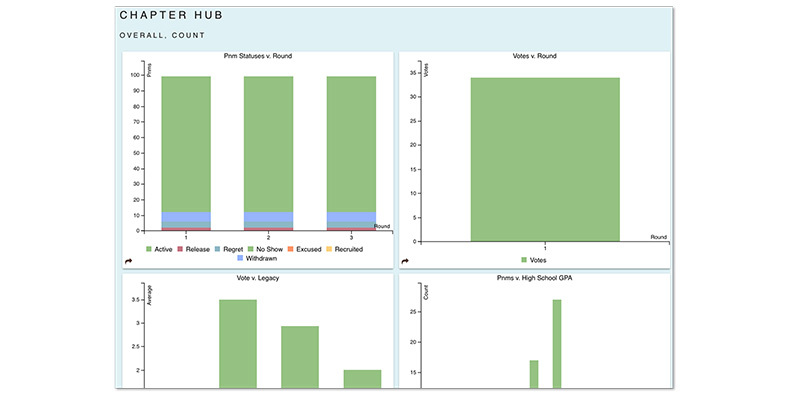 Votes Reports that keep track of recruitment results and allow your chapter to observe and compare recruitment trends. Comments Reports collect and organize the comments that your voting members make on your PNMs using your software’s sorority recruitment app. Sororities using a recruitment app can use it to view all reports on the go. 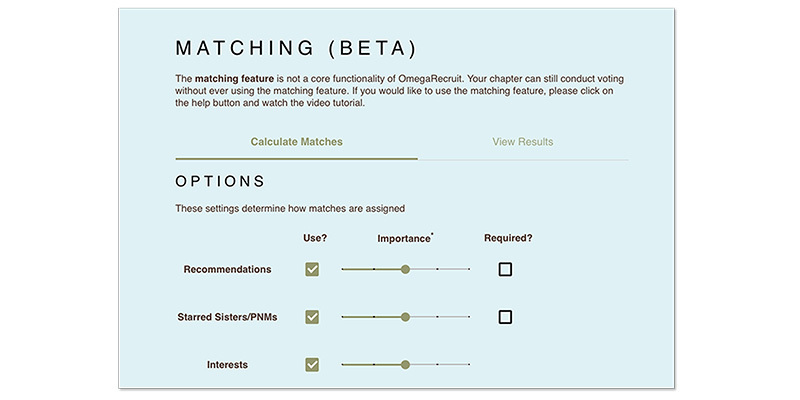 Matching Reports list the suggested matches between current members and PNMs that your voting members can make when they vote. Sharing these and other reports with the members of your chapter is easy when you choose recruitment software that allows you to export them to Excel and PDF formats. To make information sharing more efficient, ensure that your chapter is able to customize reports so that members see only the data they need, with the most important points listed first. Gathering and analyzing the data available on your PNMs is essential to your recruitment strategy, and reports are a great way to help your voting members make their decisions. Voting is also more effective when your chapter uses its sorority recruitment software to segment your PNMs. 2. Use your recruitment software to segment PNMs for a more effective voting process. Make the most of your sorority’s list of potential new members by choosing software that allows your current members to tag them for positive or negative attributes. You will then be able to sort your PNMs according to these tags. Tagging segmenting your PNMs allows all of your voting members to contribute to your chapter’s understanding of each PNM prior to voting. Here’s how it works: after you have used your sorority software to create a list of your PNMs, your voting members can add tags to each member as they learn more information. Tags can be positive or negative. Positive tags indicate desirable attributes such as family members or friends in your sorority or a history of involvement with your sorority’s chosen philanthropic cause. Negative tags indicate risk factors such as a weak academic record. To segment your PNM list, you can customize your list view according to the tags your voting members have created. Using strategies similar to those used in the process of nonprofit prospect development, you’ll be able to use your segmented PNM list to identify your top potential members and match them with the right members to talk to. Because your PNM list is most accurate and your voting members’ decisions are most informed when you have as much information available as possible, consider software that includes a sorority recruitment app. With the app, voting members can add tags to PNMs as they obtain additional information in real time. This way, your PNM list and tags are always up-to-date! Sorority recruitment apps also allow your voting members to share new information on PNMs in the form of comments, which your chapter can then access in the form of a report within the app or exported as an Excel or PDF file. With plenty of information on your PNMs readily accessible via your lists, reports, and sorority recruitment app, your chapter will be able to match PNMs with current members of your organization more easily. Your sorority recruitment software can further facilitate the matching process by using PNM and member data to generate ideal matches. The ideal new members for your sorority are those whose interests and values best align with those of your current sisters. Your chapter is looking for PNMs who will bond with your current members, creating the sort of lasting connections that inspire many individuals to join a sorority in the first place. You can seek out these PNMs through a research process similar to the way in which other organizations would use a prospect generator, and you can evaluate the compatibility of the PNMs already in your list by matching them with current members for conversation. Matching your PNMs with your current members is a highly effective way to determine which PNMs are best suited to membership in your sorority. Matching PNMs with current members can be hard work, especially since you are just getting to know the PNMs. Benefit from teamwork by selecting sorority recruitment software that allows members to suggest matches when they vote on PNMs. Want more guidance during this important part of the recruitment process? Sorority recruitment software with a customizable matching feature helps your chapter generate potential matches based on the data already stored in your sorority management system. Whether your match results originate with your current members’ suggestions, your software’s customizable match feature, or a combination of both, your matches will appear in a report. To share it with your chapter, export the match report to Excel and PDF files. Alternatively, those members using your sorority recruitment app can view the report from wherever they may be. Your voting members take on the responsibility of selecting your sorority’s newest members, so it’s essential that they are well-informed. If your chapter wants to ensure that each voting member is aware of the most important information pertaining to each PNM, you can do so by taking advantage of your sorority recruitment software’s slideshow feature. 4. Share key information with your voting members using your recruitment software’s slideshow feature. With new information on PNMs entering your sorority recruitment software system throughout the process and voting members updating your PNM list with new information and tags as they learn more, it can be difficult for all voting members to know all relevant information on each PNM prior to voting. Your chapter can keep members up-to-date on PNM information prior to voting with your software’s automatically-created slideshow feature. Your slideshow of PNMs displays the information included in your PNMs list, including the tags and comments added by individual voting members. Because your software system automatically generates the slideshow from the data that your chapter and your voting members have already input, the member of your sorority serving as the admin does not need to manually re-enter the data from the PNMs list into a presentation format. The member of your sorority serving as the slideshow admin customizes the presentation and controls the information that voting members can see. This ensures that all of your voting members see the most important information prior to making their decisions. Like the data in your PNMs list from which it is created, your slideshow is available for voting members to reference on-the-go via your software’s sorority recruitment app. 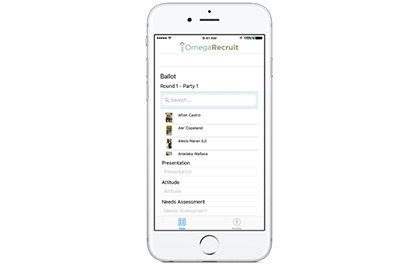 Just as an app is an important component of effective sorority or fraternity management software like the systems you may already be using, it is also a useful tool in the recruitment and voting processes. 5. Use your sorority voting app to stay up-to-date throughout the recruitment and voting processes. Your chapter can use your sorority recruitment software’s app every step of the way during recruitment. From allowing voting members to add useful information regarding individual PNMs to providing them with access to reports and your slideshow of PNMs, your recruitment app is essential for keeping everyone current. When it comes time to select new members, the app is equally useful as a convenient voting tool. When you use your sorority voting app, your members can vote from wherever they may be. They can also continue to add comments on individual PNMs that will appear on the PNMs list, helping inform the decisions of other voting members. Do your voting members want to refresh themselves regarding your PNMs before they make their final decisions? Using your sorority voting app, your members can access relevant data stored there to ensure that they are making the best possible decisions. If they want more detailed information on an individual PNM, they will be able to view profiles for each of them on the app. Using a sorority voting app allows your chapter to customize voting criteria, so you can establish your sorority’s goals and priorities and then identify the reasoning behind your voting members’ decisions. Want to know when your voting members are making their decisions? You can use the app to track voting activities in real time and communicate with other members. Your sorority voting app is also a great way to keep track of activities and events throughout the recruitment process! If your sorority is already using other sorority management software and apps, look for a sorority voting app that integrates with the systems you’re already using. Consider a sorority recruitment solution that integrates with popular platforms such as ICS and GINSystems. By choosing an app that integrates with your current software, you can ensure that you’ll be able to access all of the important data you need to make the right decisions on new members for your sorority. Sorority recruitment software and a sorority voting app make the recruitment process more efficient so that your members can enjoy the opportunity to get to know your PNMs and form friendships that will last a lifetime. With the right tools to provide your members with the information they need, your sorority is sure to have your most successful recruitment yet. Prospect Research for Greek Organizations. Help ensure the future of your sorority by using prospect research to identify PNMs who are likely to contribute to your organization in the future. Guide to Who is in Charge of Sorority Communications. Before your chapter embarks on your next recruitment process, check out OmegaFi’s guide to learn how you can clarify your sorority’s leadership structure. 6 Fraternity Recruitment Strategies to Make the Most of Rush. Follow these guidelines to ensure that your recruitment is fun, successful, and as efficient as possible.